With its exceptional 4K HDR X1 Extreme processor, the KD-65X9300E delivers fantastic HDR10 and Dolby Vision enhanced images, as well as superb object-based HDR remastering for all SDR content. It may not have the outstanding black levels of Sony's A1 OLED, but it arguably provides brighter, more vivid pictures overall. Last year's Sony Bravia X9300D impressed us greatly with its powerful X1 processor, superb colours and picture quality, ultra thin design and user-friendly Android TV operating system. Now, Sony is back with its latest flagship LED TV, the KD-65X9300E (also known as the KD-65XE9305 in the UK). A lot of talk has surrounded the release of Sony's A1 OLED television (a set that's out in the UK and US, but still awaiting release in Australia), but if you don't care enough about self-lighting pixels to wait, its new X9300E 4K HDR TV is as good as it gets when it comes to LCD/LED display technology. A next-gen processor is just the tip of the iceberg when it comes to the X9300E's improvements over last year's model, with areas such as backlighting, picture quality, design, compatibility, upscaling and user interactivity getting significant updates. Our review covers the 65-inch model X9300E, which is available now for AU$5,299 (£3,199), though a 55-inch model KD-55X9300E (known as the KD-55XE9305 in the UK) is also available for AU$3,999 (£2,399). Both TVs are admittedly placed at the more expensive end of the LED TV pricing spectrum, though there's no denying that the X9300E's craftsmanship and technological smarts befit that of a high-end product. With a brilliant design that aims for minimalistic elegance, the X9300E is engineered to compliment your living room, rather than detract from it. Its bezels are black and only a few millimetres wide, making them look almost non-existent when watching dark content, even from a moderate distance. Its slim 39mm profile makes the X9300E ideal for mounting, which is extremely easy to do thanks to the equally-slim adjustable mounting bracket that's included in the box. However, this TV looks just as gorgeous when placed on a table or cabinet thanks to its attractive, angular stand and wonderfully stylish textured back panel. With its leather-like texture and grid-and-crosses pattern, the X9300E wouldn't look out of place in a Gucci commercial. Normally, a stunning rear like this would be let down by the appearance of messy cables and numerous input ports. Thankfully, the same removable plastic panel that was included with Sony's KDX9300D last year is back, allowing you to tuck all the cables away and keep everything neat. And, because it's so easy to keep all your cords hidden, it's entirely possible to place the X9300E in the middle of a room without it looking like a hot mess. Android TV is somewhat divisive as a television OS, with some people finding it a little clunky and even sluggish. This hasn't really been the case in this writer's experience, though, with the user interface feeling like second nature thanks to the general familiarity of the Android platform. At present, all of the major Australian streaming and catch-up services are available from the Android TV home menu. If 4K content is what you're after, YouTube, Netflix and Amazon Prime Video offer growing libraries of 4K high-dynamic-range (HDR) movies and TV. Disappointingly, Stan's 4K content is so far unavailable through the Android TV app, though you can still access it with a Chromecast Ultra or PS4 Pro. You can also rent 4K movies from Ultraflix, though these movies do not exhibit high-dynamic-range visuals. The main interface has content recommendations listed at the top of the screen, usually filled with stuff that you can rent or purchase from the Google Play Store, along with recommended videos sourced from your YouTube account. Sections are arranged vertically, with content you can cycle through through horizontally. Below you'll find sections for apps, games and general TV settings. It should all be fairly straightforward for those accustomed to Android smartphones. We know that 4K and HDR prowess is the primary focus of the X9300E, but we'd also go as far as to call it one of the best TVs on the market when it comes to upscaling HD and standard-dynamic-range (SDR) content. This is due in large part to Sony's X-Reality Pro HD-to-4K upscaling system, as well as the 4K HDR Processor X1 Extreme's object-based HDR remaster functionality, which has the ability to upscale any content to near HDR quality. It does this by introducing HDR's wider colour palette to SDR video, smartly applying more colour definition and vibrance to any non-native HDR content. We tested this with a number of 1080p TV shows on Netflix, including Riverdale and Skin Wars, and found the visuals to be noticeably improved in each instance. Colours were richer, shading was more detailed, and contrast also received a boost. The results are quite impressive, and they definitely make movies and TV look better in every circumstance, minimising radial banding in the TV's corners quite dramatically. You might still find instances of pronounced blooming around light sources, but it's the next best thing after proper HDR. When it comes to 4K HDR video, the X9300E is capable of producing some utterly incredible images with commendable, if not class-leading, black levels. Of course, an LED panel is always going to play second fiddle to a proper OLED display, but the new Slim Backlight Drive+ comes pretty darn close thanks to the inclusion of local dimming technology. Two layers of light guide plates used in conjunction with a quad-edge LED structure means that the X9300E is able to provide significant punch to its bright areas and fairly deep blacks as a contrast. While Sony hasn't divulged the number of peak brightness nits the X9300E is capable of, in our testing it certainly looked appreciably brighter than last year's model. Colour management, as is always the case with Sony TVs, is exceptional. This is thanks to the company’s celebrated Triluminos engine, which never fails to produce excellent light control and terrific motion processing. On top of its HDR10 capabilities, the X9300E also boasts full Dolby Vision support, which until now was only offered on selected LG 4K TVs. We tested this by viewing Marco Polo on Netflix and were suitably wowed by the results. While it's hard for us to gauge how the 12-bit Dolby Vision content looked compared to regular 10-bit HDR, it was nevertheless quite vivid, with terrific contrast that allowed us to peer into dark areas and pick out a number of fine details that would otherwise have been lost. Skin tones looked appropriately lifelike and the colours found in many of the sets and costumes popped with an incredible amount of vibrance. Along with this 4K streaming content, we tested a number of 4K Ultra HD Blu-ray movies using Sony's UBP-X800 UHD player. We kicked things off with a viewing of Planet Earth II, which exhibited incredible detail and terrific HDR10-enhanced colours. Fine textures, like the fur on a snow leopard, looked appropriately realistic, allowing us to spot (leopard pun) individual hairs and whiskers with ease. Colours also took centre stage during a pink flamingo migration sequence, in which the blushing hues of the majestic animal's feathers appeared extra vibrant against the wintery landscapes surrounding them. Next, we watched the Scarlett Johansson action-flick Lucy and were astonished by the level of detail before our very eyes. Clarity was off the charts here, with close-ups in particular revealing pores and imperfections that gave the film a more realistic feel overall. The TV also provided Lucy with some truly-dynamic colour reproduction, especially during special-effects-driven scenes. A screening of Fast & Furious 6 on Ultra HD Blu-ray also impressed, particularly during the film's London-set night chase, in which the TV's HDR capability allowed us to see details deep within the darkness. Flesh tones also appeared lifelike and stable throughout, with skin textures looking almost real enough to touch. For gaming, the TV also performed incredibly. We tested WipEout Omega Collection on a PS4 Pro running the game in 4K HDR. For the sake of clarity, we went into the game's settings and switched off the motion blur option, giving the game an even more stable 4K resolution. What we saw, quite frankly, blew us away. Having played the game at home on a Sony 4K HDR X8500 Series TV, the difference between old and new was immediately noticeable. The X9300E's colours exhibited exceptional brightness, and there were absolutely no jaggies to be found in the game's futuristic tracks and ships. In fact, the clarity gave the game an almost three dimensional appearance, especially while winding around at full throttle. An early looking at the upcoming game Gran Turismo Sport achieved similar results, with a crisp, clean visual style that was greatly enhanced by HDR. Cars and locations have always looked realistic in the Gran Turismo series, but here, improved contrast and specular lighting made the game look much better and more faithful to the real thing than ever before. We were told that this particular game is the first ever to realistically reproduce 'rosso corsa' (Italian racing red), thanks entirely to high-dynamic-range tinkering. You wouldn't know it to look at it, but the X9300E also has a set of front facing three-way speakers that are terrifically hidden at the bottom of the set. While they obviously can't compete with a standalone soundbar or proper DTS hi-fi system, the speakers do deliver impressive sound for those of the in-built variety, with a definite focus on vocal clarity. If you're mostly into dialogue-driven shows and movies, it's fine, though we'd definitely recommend a standalone soundbar or home theatre setup. One new feature found in the X9300E that we especially liked was the ability to wirelessly pair a set of Bluetooth headphones to the set for a personal listening experience. We paired a set of Sony MDR-1000X Wireless Headphones to the X9300E and found this experience infinitely more pleasing than the usual headphone jack and dongle-based wireless headphone process we've had to go through in the past. On top of this, it being a Sony TV, pairing a Dual Shock 4 controller for use with Android games was also remarkably easy. If you prefer perfect blacks and wide viewing angles to brightness, LG’s B7 OLED TVs will be arriving soon, offering a performance level likely to be in line with the recently reviewed OLED65E7. Though you’ll need to spend a couple of grand more than the X9300E costs to secure the 65-inch LG B7. 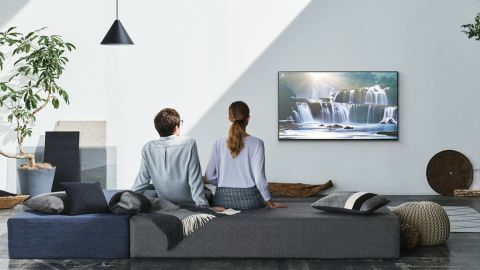 Featuring top-notch 4K HDR10/Dolby Vision quality thanks to its X1 Extreme processor, as well as truly outstanding upscaling and object-based HDR remastering capability for SDR content, the Sony Bravia X9300E is a television that promises to make everything you watch on it look as great as possible. Complementing the display's fantastic visuals is a build-quality and design that's in a league of its own. If you're looking for a beautiful television with an air of sophistication about it, you won't find a more stylish one than the X9300E. That said, if it's infinite contrast and deep blacks you're after, you may want to hold out for Sony's A1 OLED Series. With an entry price of AU$3,999 (£2,399), it's admittedly a tad expensive for an LED TV. That said, it's hard to imagine anyone being disappointed in what is an all-round excellent television.